Remember you are dust, and to dust you shall return. Here we are, taking all this time to remember mortality, to remember that none of us gets out of this life alive. In a world in which death looks like failure, in which death is the enemy, today we come and stare death in the face. You see, the worst thing in this life is not death, but it is loosing ourselves, it is dissolving into hate, or revenge, or even apathy. This is our beginning. Remembering who we are, remembering whose we are, remembering we are dust, remembering we are God’s beloved, remembering we cannot get to resurrection without first going by the way of pain and suffering, remembering our brokenness, and that the greatest integrating force, is God. Rick and I have loved exploring this most beautiful part of Wisconsin. On summer Saturdays we’ll go for a drive and see what we can see. Often we’ll say, if only we could fly as the crow, straight over the cornfields to our destination. And then we’ll comment, you can’t get there from here in a straight line. And if we could, we’d miss so much. We’d miss the milkweed on the side of the road that gives life to the monarch butterflies. We’d miss the wildflowers, the hyacinth, the asters and the daises. We’d miss the stink of the fields as they are planted with corn. No matter how wonderful the end of the journey is, or how fast we’d rather get there, we’ve got to make our way, and be present to the beauty and the suffering that surrounds us. Our journey ends with resurrection, with new life. But we can’t get there from here, unless we follow this path. And it is a path we don’t much like. It is the path of forgiveness; it is the path of repentance. It is the path on which we must let go of whatever it is that holds us hostage. It is the path of dying and rising with Christ. We begin with these ashes on our foreheads. We begin by remembering who and whose we are. We begin by re-tracing this sign of the cross. You see, you already have this sign indelibly marked on your forehead. It was traced first at your baptism. You are sealed by the Holy Spirit in baptism and marked as Christ’s own forever. We are baptized into the death and resurrection of Jesus. Those are not just words, but a statement of truth. Our lives are witness to all of the deaths and resurrections. Baptism is not an event, but a journey that takes a lifetime. Forgiveness is not a single act, but a matter of constant practice. Turning away from all that distracts us from God and God’s love for us, takes constant practice also. We often fall off the shoulder of the road and into the ditch on this journey, and in that ditch life seems much more dark. But we have been marked as Christ’s own forever, we are not left there to fend for ourselves. We come to this place of dust again and again. We come because this is the beginning and the end. We come because this is creation and this is love. We come because our memories are so short, aren’t they? We so quickly forget about the love that brings us to this day of dust. The love of God in creation, the love that gives up everything for us. The love that invites us to know who we really are. The love that looks nothing like a Hallmark Valentine’s card. This journey we begin today shows us what true love looks like. It shows us that God’s heart’s desire is to be with us not only when times are rosy, but also and maybe especially when it seems like our brokenness and vulnerably will get the best of us. The love that creates us, and puts us back together when we have disintegrated back to the dust. When it seems like we will fall apart into the dust of which we are made, God is there to raise us up, and make us anew. The ashes of this day, the dust of our lives, is where true love lives, it is where God lives. We present to the world our best put together selves, we strive so hard to make our lives seem perfect, but the only place we are perfect is in God’s love. We begin with the dust, we begin in death with Jesus in the waters of baptism. We rise out of death with Jesus, to follow Jesus’ lead to outrageous faith. We search for truth, act with justice, strive for mercy. We seek forgiveness, we repent and return to the lord. This journey is about the relationship Jesus has with you, with us. 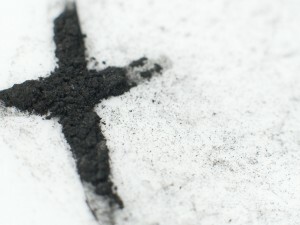 Lent is a time of intention. Intention that holds space for transformation, forgiveness, and repentance. I invite your intentions today. What is it you intend to do? What is it you must lay down, or let go of, so that you may take this journey with Jesus? Do you want to fast from something? Do you want to unattach yourself from something that holds your attention too strongly? Write that down. Make that vow. Be intentional. And then put your paper in the brazier, and we will burn those and add them to the burnt palms, and together their dust will mark us.